Be the first to share your favorite memory, photo or story of Florence "Tommy". This memorial page is dedicated for family, friends and future generations to celebrate the life of their loved one. 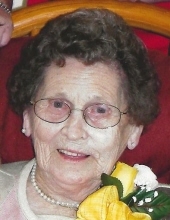 Florence Clark (Tommy) Shelton, 97, of Patrick Springs, VA, died on Saturday, April 13, 2019 at her home. She was born on June 21, 1921 to the late Tony and Alice Reynolds in Critz, VA. She is also preceded in death by her husband John Edgar Shelton, three brothers, five sisters, one grandchild and one daughter in law; Patricia Shelton and one granddaughter; Kristen Shelton. Surviving are five children; Jimmy Shelton, Johnie Shelton (Brenda) both of Patrick Springs, VA, Gloria Hawks of Martinsville, VA, Garland Shelton (Karen) of Kernersville, NC, Kathy Holt (Jack) of Collinsville, VA three grandchildren; Steve Shelton (Lori), Lisa Via (Tommy), Heather Helton (Brian) and two great grandchildren; Adalee Fore and Danikah Via. The funeral will be held on Tuesday, April 16, 2019 at 2:00 pm at Stella Christian Church with Pastor Steve Hayes and Pastor Lee Ashley officiating. Burial will follow in the church cemetery. The family will receive friends on Monday, April 15, 2019 from 6:00 pm to 8:00 pm at Stella Christian Church. Norris Funeral Services, Inc. and Crematory of Stuart, VA is serving the Shelton family. Online condolences may be made to the family at www.NorrisFuneral.com. To send flowers or a remembrance gift to the family of Florence "Tommy" Reynolds Shelton, please visit our Tribute Store. "Email Address" would like to share the life celebration of Florence "Tommy" Reynolds Shelton. Click on the "link" to go to share a favorite memory or leave a condolence message for the family.